FroYo XPress, a Purdue student startup, is developing an automated, self-serve frozen yogurt kiosk that will offer an all-natural, non-dairy frozen yogurt with minimal inventory and labor requirements. Aarti Panda, a student in Purdue University’s Department of Computer Science, and Marek Davis and Henry Berkemeier, both in the School of Industrial Engineering, co-founded FroYo XPress to improve customers’ frozen yogurt experiences with a self-serve design. The company will customize pre-existing customer service software to allow consumers to buy as much frozen yogurt as they want by pulling a lever. The kiosk will monitor the frozen yogurt volume dispensed and determine the corresponding price. “FroYo XPress incorporates the typical self-serve frozen yogurt experience into locations where traditional brick and mortar frozen yogurt shops cannot access, such as universities,” Davis said. “With our technology, we can reach customers in high-foot traffic locations with minimal inventory and labor. Similar to gas pumps’ volume-to-price conversion, a software algorithm will translate the customers’ frozen yogurt amount into a price,” Davis said. FroYo XPress has received $33,500 in funding: $3,500 from the Baylor New Venture Competition, $10,000 for placing second in the Burton D. Morgan Business Plan Competition and $20,000 from the Elevate Purdue Foundry Fund Black Award. The company aims to place kiosks in multiple locations within a community and be maintained by separate retailers but they would share FroYo Xpress as its one distributor. FroYo XPress, a Purdue student startup, is developing a robotic, self-serve frozen yogurt kiosk with all–natural and non-dairy options. The kiosk will allow customers to dispense as much frozen yogurt as they like then assign a price to that volume, with minimal inventory and labor requirements. Davis hopes the company can partner with Purdue University to place their device in a high foot traffic area such as the Purdue Memorial Union or Stewart Market inside the Stewart Center. 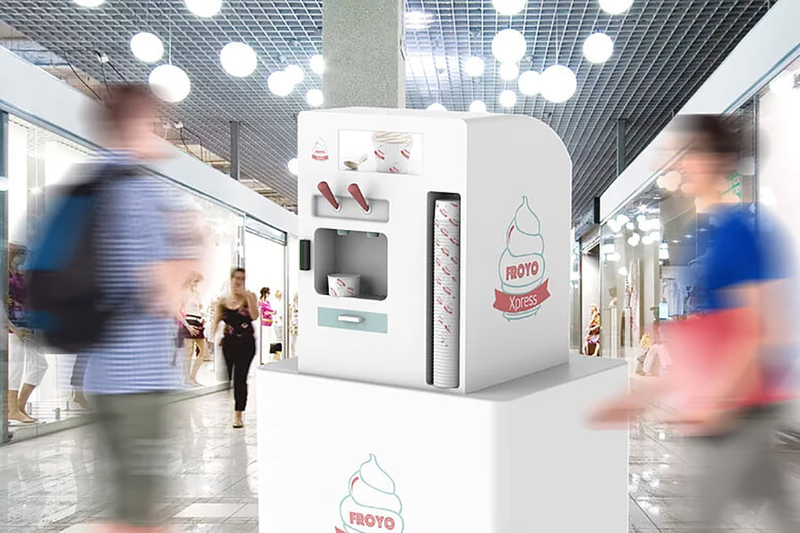 Other frozen yogurt kiosks allow consumers to choose their preferred sizes or flavors but this device will dispense the product through its own robotic programming. FroYo XPress receives entrepreneurial mentorship and support from the Purdue Foundry, a commercialization accelerator in the Discovery Park’s Burton D. Morgan Center for Entrepreneurship. FroYo XPress is seeking additional personnel with experience in electrical engineering, robotics programming, or CAD designing. The team also hopes to connect with advisors experienced in point of sales software and food safety regulations.